It is an age old question. Which is better? The book or the movie? Our collection here at the library can help you explore just this question, and let you choose for yourself. With many new DVDs based on books being added to our collection and a sizable fiction collection: get reading, get watching and cast your vote. 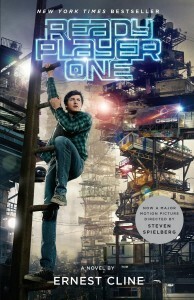 Recent weeks saw the release of the final installment in the young adult fiction Maze Runner series. This series explores a group of boys who wake in a maze with no memory of how they got there. The world becomes even more complicated when the first girl is introduced into the microcosm that is their world. Fans of dystopian YA will find these books and films highly entertaining. 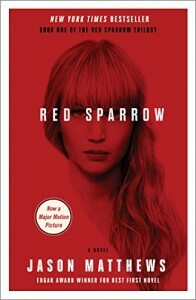 If thriller is what your craving this summer I recommend the Red Sparrow series by Jason Mathews. When a rising ballerina’s career abruptly ends and she is forced to become a soviet spy, her loyalties to family, country and love will be tested. With a movie starring Jennifer Lawerence and three fabulous books, this series will keep mature readers and watchers on the edge of their chairs and lusting for more. This eco-dystopian science fiction is certainly an example of an odd book inspiring an odd movie. When a team is sent to explore a swath of land reclaimed by the wilderness, questions abound about what happened to previous teams sent on similar missions and just what might be in those woods. With a book that makes the characters side notes in a fabulous world and a movie that tries to provide more thoroughly fleshed-out characters, this combo highlights how a director’s choices impact a book to film adaptation. One of my all-time favorites, Ready Player One, explores a world where virtual reality is the new way of life and the pop culture of the 1980s is king. When the creator of the company that created the software that is key to the virtual world dies, it sets off the world’s greatest treasurer hunt--to be the first to find the keys that will unlock a fabulous prize. A light entertaining ride, I recommend this book to computer geeks, sci-fi fans, and nostalgia aficionados of all ages. For extra fun explore the audio book read by Star Trek alum Wil Wheaton.